This workshop aims to bring HAQAST PIs and stakeholders/members of the public into close discussion. The public meeting featured interactive presentations, talks, roundtables, and a poster session. 8:30 – 9:00 Pick up nametags outside room 554. 1:45 5 minutes: Rui Wang, Identifying the spatiotemporal variability of NH3 across the contiguous U.S.
Poster dimensions are 40 inches x 30 inches, either landscape or portrait. Panu Teeratakulpisarn, Association Nitrous Oxide to determine SLEEP WITHOUT CLOSING EYES (DOZE OFF) in road traffic accident in Thailand. 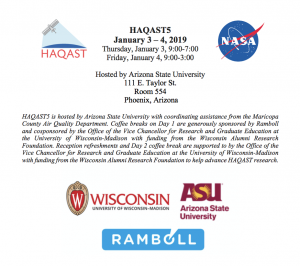 Q: Will NASA be providing funding for stakeholder travel like they did for HAQAST4? A: Yes! See above to apply. Q: What is the latest I can wait to book my hotel? A: If you are planning on coming to HAQAST5, you should book as soon as possible. There is no advantage in waiting, and if you delay too long, you will not be able to take advantage of our discounted room rate. Q: When will an agenda be available? A: Since we generate the agenda from the registration list, a final agenda typically isn’t available until a few weeks before the conference. A draft agenda will be available sooner, and if your agency requires an agenda for approving travel, please reach out to Daegan Miller, HAQAST communications coordinator. Q: Is there an attendance fee? A: No. HAQAST5 is free to attend.